The last time that I was in the hives, I did not inspect the Meadow Hive. 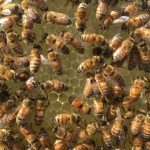 They seemed to be slower with growth than the other three hives and I didn’t want to bother them too much. I had been in the hive a few times to check on their syrup intake, but not a full inspection. 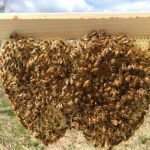 On May 1st, I headed out to the Meadow Hive to see how they were progressing. The weather was on the cooler side, but it was nice and sunny. 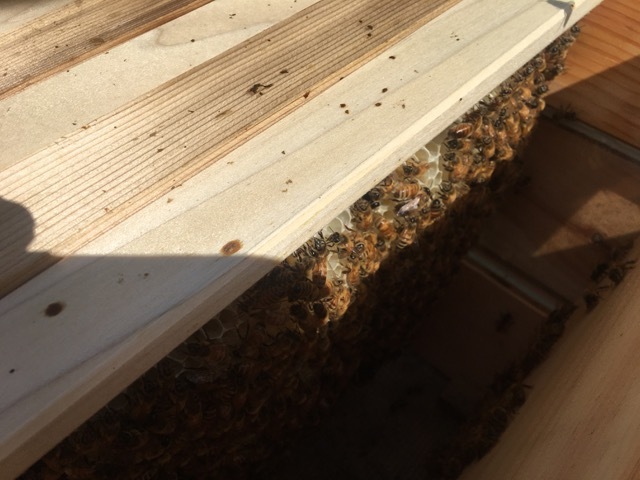 The bees had not been eating the syrup, so I removed the feeders from the hive. Even though they had not been taking the syrup, they gave me a nice surprise. They had built comb on five of the six empty bars that they had. To give them some more growing space, I gave them two empty bars. They had brood on six of the seven bars of comb and five of the bars had capped brood. 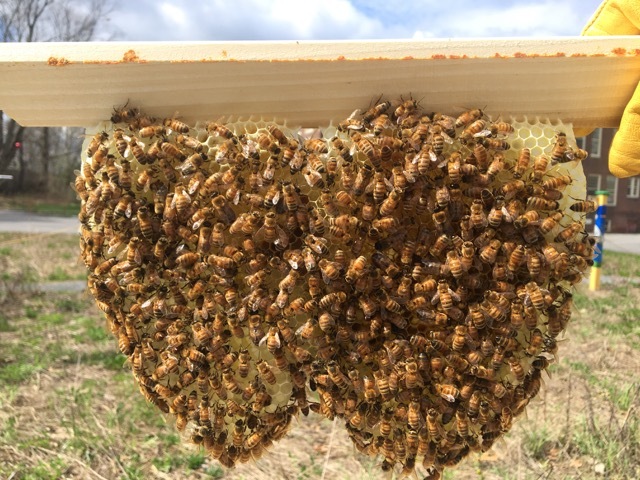 When I was looking at the brood, I kept thinking that it doesn’t look the same as the brood in the other hives. I couldn’t quite pinpoint what was different though. It may have been that there was more drone brood than I was expecting. I will keep an eye on things to make sure that the colony is doing well. The final bar that I inspected had the queen on it. 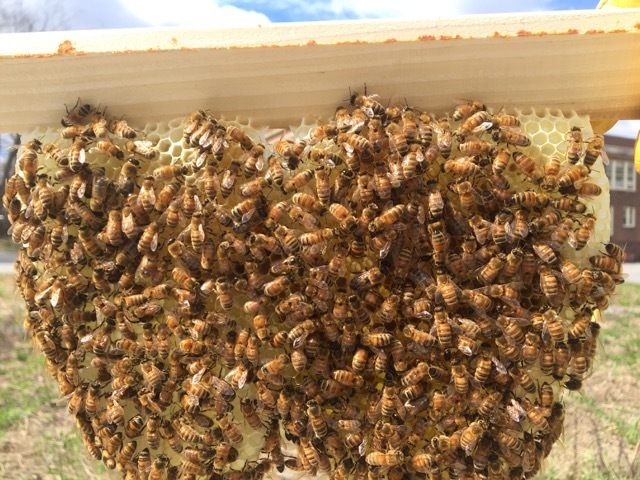 This queen is a big queen with such deep color. The bees are collecting lots of pollen and nectar. There was nectar stored on three of the seven bars. 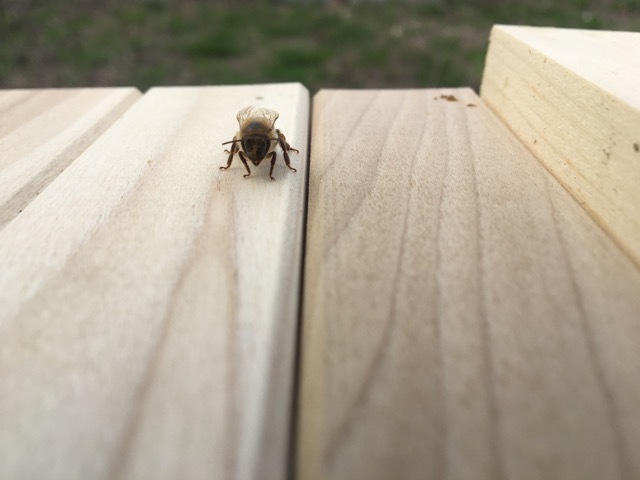 They also had a good amount of pollen stored on one of the bars and a smaller amount on another bar. 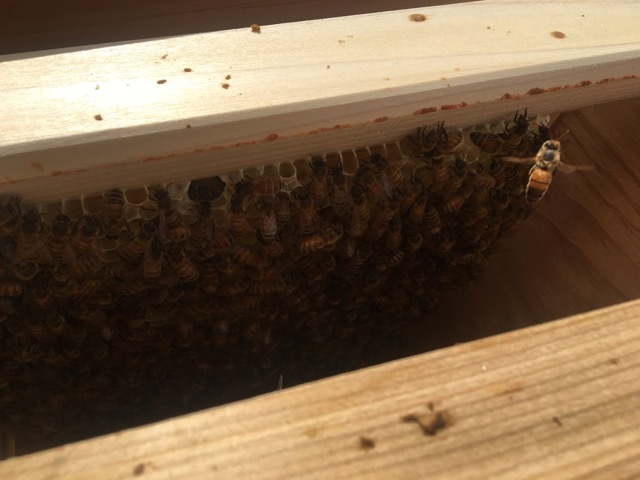 This colony was sweet and easy to work with today. They barely seemed to notice that I was there. They also didn’t seem to mind that the temperature was only about 55 degrees. 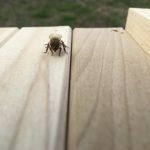 After I closed up the hive, I spent some time watching the bees going in and out of the hive. There were several bees that came in covered in pollen, not just full pollen baskets. The pollen was different colors, so I know there are several types of forage available to them. Sources of water had been a concern for this colony. 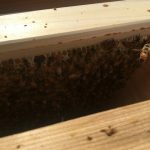 I had been filling bee waterers for them and was thinking that I would need to find a better solution during the summer. Then, I realized that there is a river near by and a creek in the park across the street. 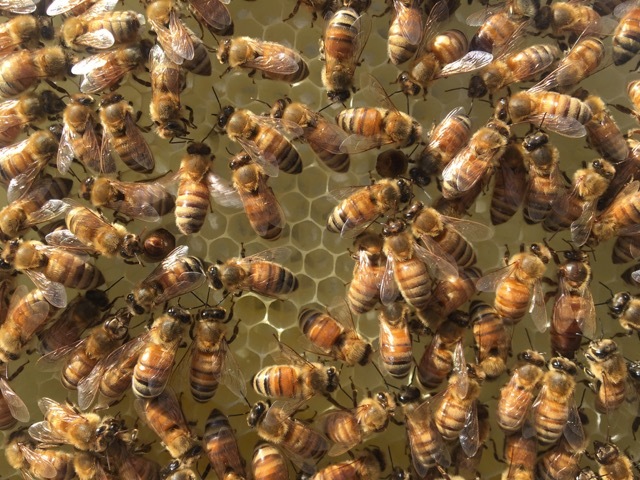 These bees will be able to find water without me supplying it for them. What a relief to not have to lug water out there everyday. 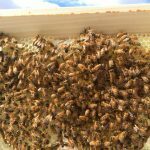 I am also very relieved to see them building comb and growing, they had me worried in the beginning.